The universe did not want me to watch The Bachelor last night, but I fought back and won. Barely. My battle included a dinner party, a major house fire, and learning to work my parents’ DVR. I didn’t get to start watching last night’s episode until 10 p.m., but in the first five minutes, I saw Ben in nothing but royal blue boxer briefs, casually putting on jeans in a marble bathroom. I took this as a sign that this episode would be worth staying up past my bedtime. As Ben walks into the room to pick up his 10 dates in a room full of 20 women, some wearing Lulu Lemon to show they’re “chill” and some in their favorite Anthropology body suits (100% of them in full makeup), Olivia the News Anchor clings to JoJo like she’s never experienced this emotion called “excitement” ever before in her entire life. First of all, leave JoJo alone, Olivia. She’s supposed to be the next Bachelorette and doesn’t need to be associated with your deranged faces. Second, you’re not even going on the date. Olivia was making this face before we even got a taste of her Villain behavior. By the end of the episode, she easily earns her rightful place as Top Villain and resident Dementor. While Olivia and her prey remain at the mansion, the group date girls all put on their matching white converses and hop in a limo. When they arrive at the high school, Ben waits at the bottom of some steps as a stampede of crop tops and ombre hair comes racing towards him. I can see fear in his eyes. They go inside, where Chris Harrison appears in nerdy glasses and a moth-eaten brown sweater vest to tell the girls that they will compete in a series of events to become Ben’s Homecoming Queen. Most of them graduated high school last year, so this all feels a little too real. The girls are paired in teams, don white lab coats, and head to “Science class.” Here, they have to combine “chemicals” labeled as “love,” “communication,” “trust,” and “appreciation” to…wait for it…”make Ben’s volcano explode.” Gulp. Lace and Jubilee are eliminated. Jubilee threatens Lace’s life and I believe her. Jackie and whoever her partner was were eliminated. All the girls tell the camera that Jackie isn’t good with her mouth, with mischievous grins on their faces. We all send up a little prayer for their fathers who are watching. Geography class is next, where the girls have to place a cut-out of the state of Indiana on a blank map of the United States. Three teams sort of succeed. One team puts the state sideways where Pennsylvania should be. Educators around America wince and pour themselves more wine. What makes it worse is that this team is Becca and JoJo, two of my favorites. I don’t want to talk about it. The final test is Gym class, where the girls have to make a certain number of basketball free throws the fastest. Ben’s least favorite team– Mandi and Amber– wins. These two then have to race down a track over hurdles to determine the final Homecoming Queen. Ben looks defeated before the race even starts. Mandi wins. Ben dies a little inside because he is now forced to spend 10 full minutes “alone” in a convertible with the chicken lookalike while other, hotter girls silently watch them converse from a distance. The second half of the group date is far less interesting. It’s mostly Lace the Producer Pick telling everyone she is not crazy, while doing something crazy every two minutes. Ben kisses Jen. Then Jubilee. Then JoJo. They all kiss and tell. Lace does not take the news lightly. The group date rose goes to JoJo. The next day, Ben shows up at the house to take Caila on the first one-on-one date of the season. Olivia the News Anchor (Top Villain, Dementor) is not wearing makeup, and I wish she was. The girls all stand in the driveway to watch Ben and Caila drive off in a convertible. Oh, and Kevin Hart (comedian) and Ice Cube (vaguely familiar actor/rapper) tag along in the backseat of the car. My guess is that they’re somehow affiliated with ABC and are on the show to promote something that I don’t know about. The whole first half of the date is a gimmick to try and make Kevin Hart seem funny, but I’m not entertained. It concludes with Caila and Ben in a hot tub…inside a hot tub store…drinking champagne while Kevin Hart skinny dips right next to them. I feel bad for all parties involved. The second half of their date is much less cringeworthy, other than Caila’s Mother of the Bride glitter shawl and 1920s character shoes. Caila and Ben share easy conversation and dazzling smiles. He gives her the rose, then they go to a private concert by someone only Ben has heard of. Caila pretends to be impressed by the “famous person,” but really, she’s just excited about slow dancing with Ben. They kiss and she’s way more into it than Ben, but that’s probably just because she already decided that he’s going to be her husband and he still has 20 other hot girls to choose from. Ben takes the girls to a “love lab” where they are tested to see which girl is most compatible with Ben. They are strapped with wires (after changing into white booty shorts and tank tops), then look at a picture of former Bachelor Sean Lowe next to a picture of Ben. The test determines who the girls stare at the most. Next, they have to run on a treadmill to break a sweat, which takes some less time than others. Ben then comes over and smells their pheromones, i.e. body odor. Typical first date stuff. Last, each girl sits on a bed with Ben in various sexual positions to see who arouses him most. Oh, by the way, the girls get to watch each other have their turn with Ben on the bed. Olivia the News Anchor (tNA) quietly tells Ben she wants to kiss him while they’re on the bed, but he refuses because other girls are watching. Good job, Ben. Sam gets the lowest overall compatibility score: 2.4 out of 10. During the evening portion of Group Date #2, Ben kicks things off by pulling Olivia tNA aside in her hot pink bib dress, much to the dismay of all the other girls. She already got the First Impression Rose and won the compatibility test. Why am I even here?? Ben takes Olivia to the apartment he “lives” in. She takes this as a sign that he wants to marry her. They have no conversation at all and proceed to make out for ten minutes. This pleases Ben. I am concerned that the Dementor just sucked out his soul. When Ben walks Olivia back to the group, he wipes off his mouth in plain sight of his other dates. Olivia sits down among the other women and is greeted with icy silence. She then begins her mind trick games that I believe will be a staple of this season. The first one was to ask the other girls where they want to talk to Ben during their one-on-one time, which is not something most girls have thought about. This then makes them wonder where Ben and Olivia went. As a natural course of conversation would lead, they ask Olivia where she went. Olivia says she doesn’t want to talk about it, and slinks away to the bar. Now the girls are really freaking out. WHERE DID HE TAKE HER??? Olivia: 1. Other girls: 0. Amanda and Ben have their one-on-one time under a thin blanket on an uncomfortable-looking couchbed. She tells him she has two daughters. He looks genuinely elated. They have real conversation and actually start getting to know each other. America falls in love with her. Ben seems like he does, too. Two minutes later, Ben gives the group date rose to Olivia tNA. Bachelor Nation screams at the T.V. 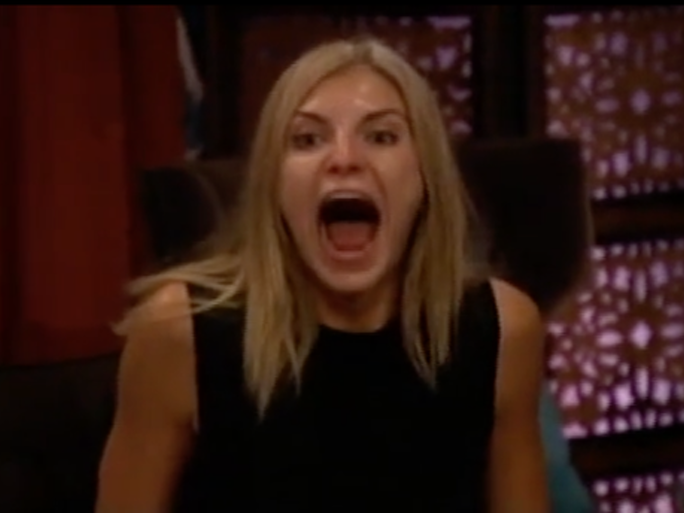 Olivia opens her mouth so wide that I can literally see Ben’s mom on the other side of the country sitting in horror. Use your other head, Ben! We return from commercial break to find ourselves already halfway through the pre-rose ceremony cocktail party, where three unlucky ladies will be soon be rejected by their soulmate. Lace, yet again, tells Ben that she’s not crazy, then proceeds to act as insecure and crazy as possible. Olivia continues to get in the heads of the other girls by spending a lot of one-on-one time with Ben, even though she already has a rose. Ben does something no Bachelor has done before, and presents some girls with gifts during the cocktail party. He brings hair clips and little roses to hot glue together with Amanda so that she can give them to her daughters. We all cry a little and thank Mike Fleiss for choosing him as the Bachelor. He also gives Lauren B. a picture of them together from the first night, and Lauren H. (teacher) a blue ribbon for making his volcano explode the biggest on the group date. I hope her kindergarteners aren’t watching. LB— Plot twist: LB says she can’t handle the crazies and kindly rejects the rose. Ben seems unfazed. I thought she was Shushanna the Russian this entire time, which goes to show how invested any of us were in that relationship. I never thought I’d be saying this, but…did anyone else feel like the twins were the most normal girls on this episode? Can’t wait to hear your thoughts! And don’t forget to share this post if you, too, think Olivia is actually a Dementor.